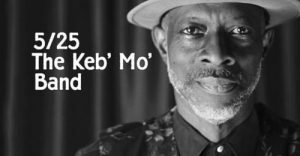 Over the past two decades, Keb’ Mo’ has cultivated a reputation as a modern master of American roots and blues music through the understated excellence of his live and studio performances. It all took off in 1994 with the self-titled release and over the years, he has proven that he is a musical force that defies typical genre labels. Album after album, 11 in total, garnered him 3 GRAMMY awards and a producer/engineer/artist GRAMMY Certificate for his track on the 2001 Country Album of the Year, Hank Williams Tribute – Timeless. He has received 11 GRAMMY nominations, in total, including Country Song of the Year for “I Hope,” co-written with The Dixie Chicks, and 3 alone for his 2014 self-produced release, BLUESAmericana including Americana Album of the Year. Keb’ has also been awarded 11 Blues Foundation Awards and 6 BMI Awards for his work in TV & Film.